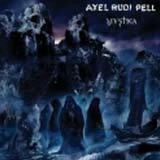 Axel Rudi Pell is back with his newest album, Mystica, the fourth in a row with the same lineup. Vocalist Johnny Gioeli is back for his fifth album with Axel. If nothing else, one thing can be said for Axel's solo band; he is consistent. Generally speaking, I enjoy all albums he has churned out over the years, all the way back to Wild Obsession. Of course, I enjoy some albums more than others, but I can honestly say the man has never released a bad album. Always able to surround himself with talent (Jeff Scott Soto, Gioeli, Jorg Michael, Mike Terrana, Rob Rock, etc…), it's no surprise that each album is usually at least pretty good. He seemingly does use the same formula on most albums: mix a couple European power metal style songs with several mid tempo melodic metal cuts, and throw in a couple ballads to round out the mix. So, there's not a whole lot of "reinventing" of sound going on from album to album, but instead they have found their niche and are sticking to it. Luckily for us, Mystica sees Axel and the guys in top form, providing many shining (yet admittedly very predictable) moments on this disc. I was a bit let down with Shadow Zone, but the follow up album, 2004's Kings and Queens featured songs of a much higher quality, allowing me to forgive the mild shortcomings of Shadow Zone. Well, perhaps the stability of the current lineup has resulted in a steady and efficient machine kicking out cool tunes, because Mystica picks up where Kings and Queens left off. I don't think it's quite as good as its predecessor, but still, this is a fine album that will certainly please fans of this band. After an obligatory intro track, the album starts off with the powerful Fly to the Moon. This is a memorable melodic metal anthem bordering on power metal that any recent fans of the band would expect to open the album. It's one of the better tracks from the album; and a great way to get things going. From there we get four very strong mid tempo melodic metal tracks force their way into your memory upon first listen. Each of these could be considered killer tracks in their own rite. Gioeli's gritty but powerful voice hasn't lost a bit. As always, he sings with a convincing passion that gives the songs a strong punch. No Chance to Live is the sixth track of the album, and the first ballad to be found. I have found some of Axel's ballads in the past to wander on way too long, or simply bore me from the first second to the last. As with the rest of the album to this point, the quality of this ballad is very high. Again, Gioeli's emotional vocal performance is a highlight, with some soulful guitar work from Axel and a very melodic chorus line combined to make this track a winner. Furthermore, the lyrics on this track take on a very sad and serious nature. The song deals with animals that are doomed to live their lives in laboratory test cages. Since I am an animal lover myself, I have a great appreciation for the message Axel is conveying with this track. Next up is the title track, an epic track the straddles the fence between slow and mid tempo. Some subtle keyboard provide a "mystical" atmosphere that works quite well, and Axel provides a steady supply of deliberate riffs and a flashy (but not over indulgent) solo about two-thirds through the song. The big chorus line here may have benefited from a slightly kicked up tempo, but it's still enough to ensure that this song makes its impact. The instrumental Haunted Castle Serenade follows up, but I have to admit that this is filler to my ears. It's a bit laid back in nature, so it starts to weigh down the album after the ballad No Chance to Live and the title track. Honestly, it's not even an exciting instrumental, so I really don't see the point. Another rocker ala Fly to the Moon would have been perfect here to give some variation to the running order of the album. Fortunately, the next track Losing the Game provides exactly the variation that I am seeking here. This is a well performed, catchy and upbeat melodic metal cut that the band seems to whip out of their pocket with ease lately. It's not a mind blowing track, but it's certainly a very good rocker, especially for the number 9 spot on the album. Closing the album is the nearly 10 minuet long The Curse of the Damned. Like the title track, this song is rich on atmosphere. Some subtle piano runs accompany the first couple minutes of the track, but it builds into a guitar driven rocker, then fades back into a laid back piano accompanied track. After an extended solo from Axel, the song explodes into an instrumental double bass driven powerful section, again fading into a laid back section carried by some soulful solos from Axel, the pianos, and the re-emergence of Gioeli's emotional vocals. All in all, this is a nice journey that isn't completely predictable, and makes good use of the nearly ten minutes allotted to it. While not a head banging track, it is a quality tracks that makes for a nice finish to the album. While Mystica may not be Axel Rudi Pell's finest album, it's a strong one that is a very logical follow up to Kings & Queens. Some moments are better than others, but the entire album is very enjoyable. The balance between powerful, mid tempo, and balladesque moments is well distributed as well. Fans of the band who enjoy Axel's sound and don't mind the same blue print album after album will find a lot to like here. No surprises or pretentions here, just good melodic metal Axel Rudi Pell style.